Who wants to find the best food to eat in Amsterdam? 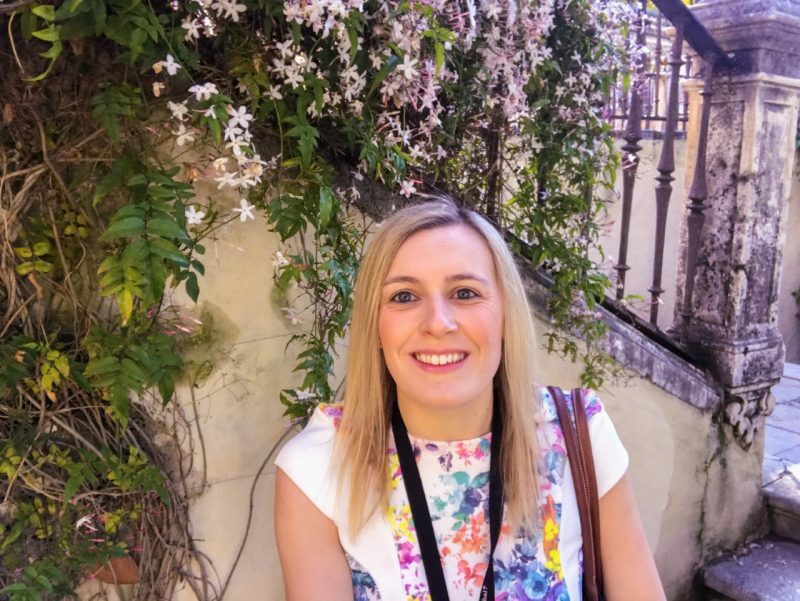 While planning my weekend trip, I spent all my time investigating where to eat and to be honest, I was spoilt for choice. I ended up trailing through review after review on TripAdvisor, taking screen shots of photos on Instagram and reading numerous articles to find those Dutch delicacies. First stop upon my arrival was the Amsterdam Cheese Museum. This is positioned close to the Prinsengracht Canal and is the perfect place to mooch while you are waiting to visit the Anne Frank House, which is no more than 150 metres away. Now, whilst this is a described as a museum – I am not sure I learnt that much. To me it is a great cheese shop, with tasters aplenty. Gouda, gouda and more gouda. There are so many varieties, all creamy in texture, with samples of truffle, pesto, liquorice and lemon to try. All cheeses are vacuum packed and easy to transport home. The cheeses do not need refrigerating straight away which is ideal if your hotel or hostel doesn’t have a fridge. 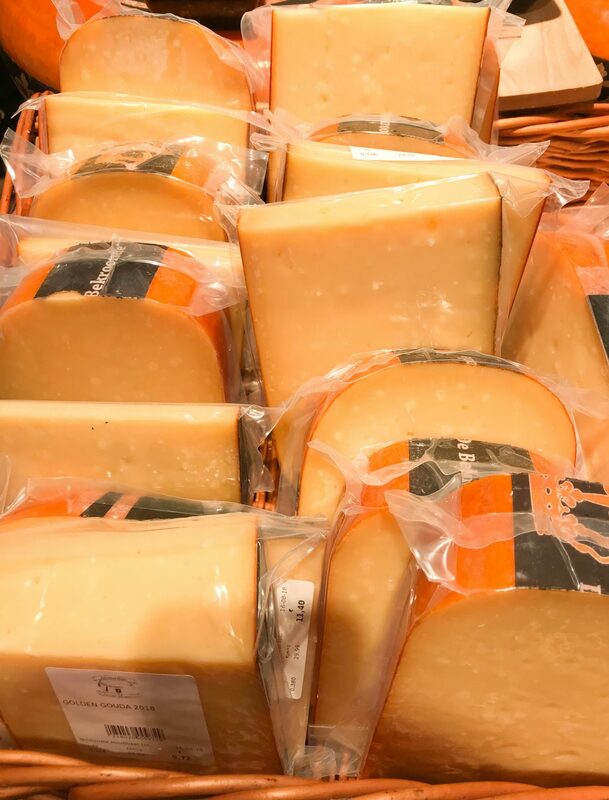 I returned here on my last day to pick up some Golden Gouda as it was full of flavour, had crunchy crystals and a rich aftertaste. Next stop on my foodie tour was De Mannen Van Kaas. This is a superb delicatessen to stop at for a spot of lunch, a coffee or an afternoon snack while exploring the cobbled streets. The loaves are a combination of pizza and focaccia bread. 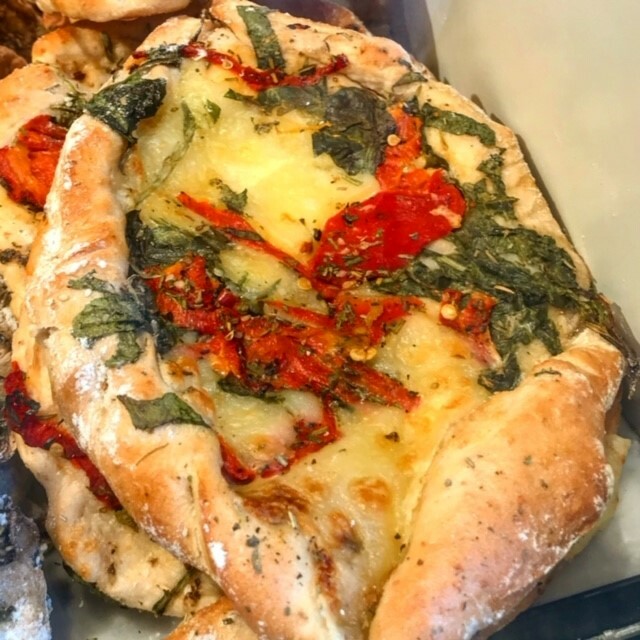 I chose one filled with tomato, spinach, roasted paprika and mozzarella. You can decide to eat them hot or cold, but I suggest you share with a friend or loved one as portion sizes are quite large. My eyes were bigger than my stomach, but it was worth every bite. I have fond memories of eating ice-cream on holiday with my family as a child. In fact this is something that has stuck with me as an adult and regardless of the weather, I will always find the need for an ice-cream, gelato or sorbet. The sun was shining in Amsterdam during my visit, with 26-degree temperatures, so a visit to Ijscuypje was in order. 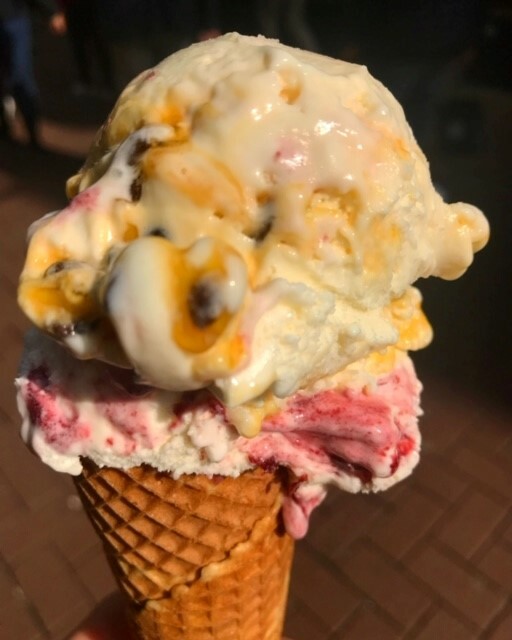 Renowned as Amsterdam’s best homemade ice-cream parlour with flavours such as marzipan, coconut and raspberry, apple pie, and almond cookies, there is something for everyone. I would highly recommend the passion fruit cheesecake and cherry yoghurt. Now, lets talk stroopwafels. If you haven’t tried them, then you need to. If you have tasted them already, you need to eat more of them. If you don’t do it for the taste, then do it for the gram. 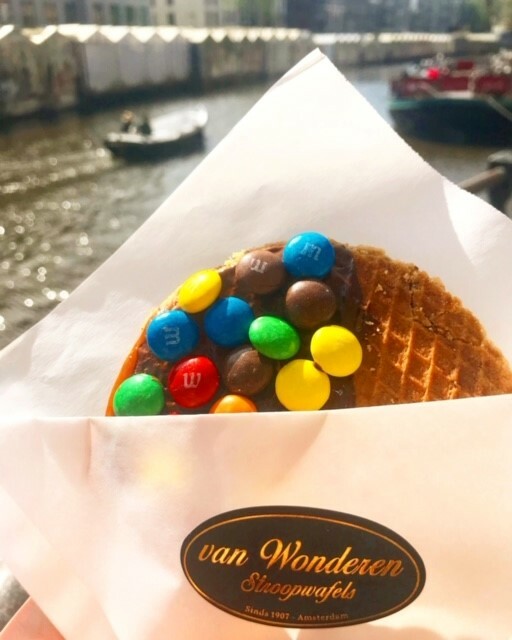 Van Wonderen Stroopwafels will be worth it for that picture-perfect snap by the canal. They are not the cheapest by any means, but you will savour every bite of gooey caramel sandwiched between two layers of waffle. They are then dipped in warm milk chocolate and topped with M&M’s, caramel chunks, marshmallows, or hazelnuts. These stroopwafels will melt in your mouth. When searching for dinner suggestions, there was one restaurant that kept grabbing my attention with its street art vibes, animated graphics and quirky menu, and that was Vegan Junk Food. Now I am not a vegan, but I am completely open-minded when it comes to food. In fact, I like to try anything and everything. I found the plant-based menu intriguing and so I ventured off the beaten track and away from the city centre to Staringplein. Unfortunately you cannot book a table so be prepared to queue, and payment is by card only. However, service is quick, and food is served piping hot. 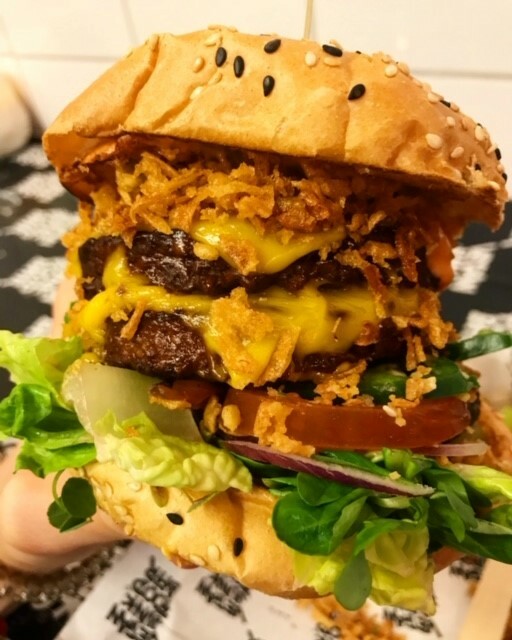 It has an almost fast-food vibe to it with a selection of burgers and specials, but in an edgy way. I chose the Daddy Mc Chik’n with Loaded fries – these were both packed full of flavour and texture; for my first vegan experience, I was pleasantly surprised. The last recommendation is my absolute favourite and if you take one thing away from this blog post, then it has to be De Vier Pilaren. 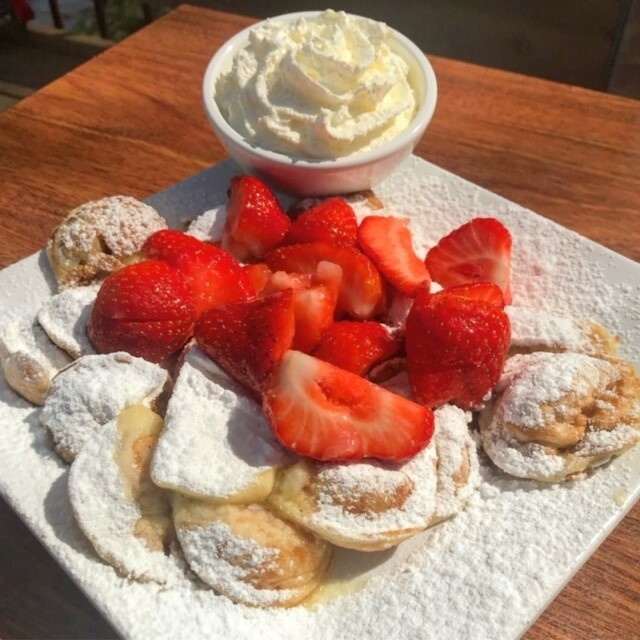 Poffertjes are the lightest, fluffiest pancakes you will ever taste and are sprinkled in sugar, covered in cream and topped with strawberries. I shared 10 mini poffertjes but shortly after finishing my half, I wished I had gone for a full plate. Build up an appetite by cycling or walking through Vondelpark and then stop here for lunch! It is an absolute must. What a lovely food post, it’s make me so hungry now especially with those pictures! I really need to visit Amsterdam to try all that food! Omg I didn’t eat any of these things while I was in Amsterdam! I missed out for sure, I will just have to go back again.